While larger networks such as CBS and NBC reach much higher percentages of households, Hearst is the leader among independent broadcasting companies in number of households reached. As of August 5th, 2009, Hearst Television Inc. no longer reports to the U.S. Securities Exchange Commission (SEC) as an SEC reporting company including periodic and annual reports. (4) In 2010, the Leadership Directories cited that Hearst Television Inc.’s annual revenue exceeds $750 million compared to $720.5 million in 2008. (5) (6) Hearst Television Inc. employs approximately 3400 employees and their top competitors include Sinclair Broadcast Group, Inc., Raycom Media, Inc. and Local TV, LLC. Hearst Television Inc. has ABC, NCB and CBS affiliates as well as a partnership with Internet Broadcasting. Hearst Television Inc.’s Election 2012 application for iPhones and Android phones included in-depth coverage of the National Presidential Election. Current CEO and Chairman of Hearst Television Inc.
Current President of Hearst Television Inc.
Telemundo Media is a division of NBC Universal. It’s the second largest Spanish-language network in the United States also ranking second largest content producer worldwide. The network delivers its content via Telemundo Network, a Spanish-language television network that carries original productions, news and first-class sports events, and theatrical motion pictures. Telemundo reaches an audience in 210 markets through its 14 stations located across the nation and its broadcast and cable affiliates. Including Mun2, the primary voice for young Hispanics in the United States, entering households through satellite, digital and analog cable. Telemundo Digital Media is Telemundo’s leading digital platform that shares original content, including mobile devices. Telemundo International, it’s international distributor, syndicates content to over 100 countries in more than 35 languages. 1.Family is the core of the Latino Identity. 2. Several Latino families interact in an “ambicultural” life, including members speaking both Spanish and English. This impacts their mindset, product and media consumption choices. 3. Spanish television correlates with family and culture on a personal level. 4. Hispanic families regularly use electronic devices to success Spanish language content. Edwin Thomas Meredith founded the company in 1902 with its first publication, Successful Farming. Meredith Corporation has its roots in magazine and print publications and later began expanding into other markets such as digital and broadcasting media. The Television sector of Meredith Corporation, Meredith Local Media Group, spans nation wide. Meredith owns twelve affiliate stations across the country, six of which are in Top 30 markets. They deliver local news with the help of advertising and the other Meredith brands. As part of Meredith’s Local Media Group, there is an entity known as OneService. It has close local ties to Meredith’s affiliate stations. Because local newspapers and newspapers in general were becoming obsolete, Meredith came up with this service to help share time sensitive information, more specifically obituaries, on a bigger and more effective scale. People were too tied down by the schedules of the newspapers that this important information could not be released properly. 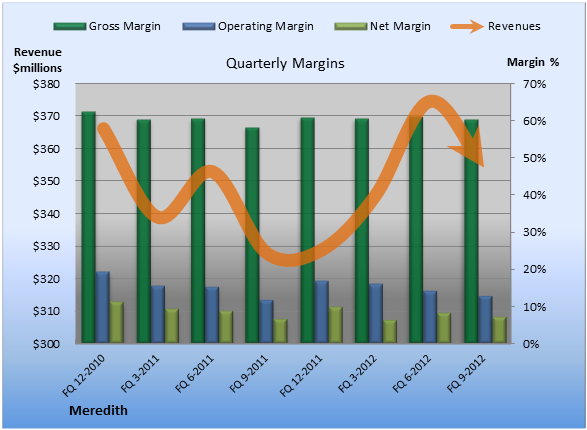 Meredith’s broadcast network revenue was up 26% from the previous year financial recordings. Revenue from advertising and this year’s election definitely had a great impact on their quarterly numbers. “While $12 million of political advertising paced the local media group, broadcast’s core ad revenue grew 5% in the quarter.”  They reported increased revenue from all of their affiliate stations, all of which broke records. The two leaders were their Las Vegas and Hartford stations. In addition to political ad revenue, automotive ad sales increased to 12%. CEO, Stephen Lacy, stated that this was record-breaking for Meredith Corporation and its Local Media Group. He also said that Meredith’s digital sales were up significantly as well. Univision, owned by Viacom, is the largest Spanish-Language medium in the United States. With top markets in Miami, Houston, Los Angeles and San Antonio Univision has expanded from television and radio to a multi-platform digital presence. Also the audience base has shifted from not only Spanish-speaking, but also bilingual Americans, who identify with the company’s Hispanic niche. Univision is continuing to grow partnerships with philanthropic, outreaches to better serve their Hispanic community. At its 50th anniversary Univision celebrates their success as a part of the mainstream media companies along with Fox, ABC,NBC, and CW. Univision has historically monopolized Latino television in America. According to Nielsen rating they have the world’s largest audience of Spanish-language television viewer. Jerry Perenchio created the Spanish-Language television station in its infancy and now Randy Falco, as the recent CEO, oversees the companies continued success . Univision’s was founded 1986 when it was formerly called SIN, Spanish International Network- originally designed for the management of advertising sales for the main station SICC, Spanish International Communications Corporation founded in 1961, in San Antonio, Texas. Univision developed in terms of their business strategy and content before the increase, of their target market. This major rise in Latinos, seen in the dramatic rise in hispanic names in the US, in combination with the fact that so Univision is the most famous and the oldest Latino media presence in America, has allowed for Univision’s success. Also, Univision has no Spanish-Language competition, and none of their competitors like NBC, ABC and CBS attempt to attract Univision’s audience base  . Even when these large media conglomerates try to reach the Latino market, like nbclatino, the content is only changed into Spanish, instead of completely repackaged and retargeted for the Latino market. Little is known about the about the specific financials of Univision because they are owned by Viacom. Although, revenues in the fourth quarter declined 17% to $3.36 billion, in Viacom’s Fourth Quarter report, this was due to lower income than expected in filmed entertainment (which isn’t to say that Media Networks are under or over performing). Also the operating cost of Media Networks is down $25 million to $933 million. Viacom though has experienced decreases in revenue as a whole in compared to the conglomerate’s statistics from last year. Viacom appears to be falling behind with it’s main competition Disney which reports a $744 million increase in Media revenue in their fourth quarter . As of close of the market on November 30th, was up .41 points in the NASDAQ from their opening at $51.89 a share . More holistically though, since late August Viacom has shown some major growth, the most significant being their climb from below $49 per share in early September to above $54.05per share in the middle of that month. Overall, though no substantial financial data can be found based on the most recent data of Viacom, or Univision in particular, beyond proof of their activity as a multi-million dollar media conglomerate. In terms of News broadcasting, Univision,has become very successful with their use of co- anchors, Jorge Ramos and Maria Elena Salina. These two recently made history by being the first Latinos to be honored with the lifetime achievement award, which represents their work in broadcasting on both traditional and digital mediums . Univision is also the only certified Spanish-Language Broadcast in the country. Univision, and Ramos and Elena, also made history in broadcast news through their “Meet the Candidates” interviews, which were the first time Presidential candidates were interviewed specifically to address Hispanic Americans. The pair also co-anchor Univision’s nightly news program “Noiticiero Univision” and Ramos host an in-depth weekly public affairs show “Al Punto”. Although Univision, isn’t dominating the nightly news market with their competitors, NBC and ABC, their line up and anchors are producing high-quality award-winning content . Univision is having success with their new telanovela “Amores Verdaderos” which was the fifth ranked program of the night in all of television among Adults 18-34, beating first-run episodes of ABC’s (“The Middle,” “Nashville” and “The Neighbors”), CBS’ entire primetime line-up (“Survivor: Philippines,” “Criminal Minds” and “CSI”), NBC’s (“Chicago Fire”) and the CW’s entire primetime line-up (“Arrow” and “Supernatural”)  .” And this show did very well, Univision’s top markets; it was named No. 1 “in the time period among Total Viewers 2+, Adults 18-49 and Adults 18-34 in Los Angeles, Miami and Houston.” This show also was a personal best of Univision itself, beating out its other top two primetime shows “Soy Tu Dueña” and “Amor Real.” Amores and Verdaderos also reached over 5.5million views for their time slot of Wednesday at 7pm . Tapping further into that vain, the company has a five romantic telanovelas set to launch all through November and December, to ensure a ‘Love-Filled Holiday Session . These shows include “Tres Mujeres” (Three Women), “Un Gancho al Corazón” (A Blow to the Heart), “El Noveno Mandamiento” (The Ninth Commandment) , “Salomé,” and “Soñadoras” (Dreamers). Univision’s strongest programing is their primetime lineup which as not only beat out competitors but also represents the company’s personal growth . Regularly Univision’s strong hit of romantic telenovelas, like Por Ella, Soy Eva” (For Her, I’m Eva), “Amores Verdaderos” (True Love) and “Amor Bravio” (When The Heart Commands) take out shows like AC’s “Private practice” CBS’s “CSI:NY” NBC’s “Guys with Kids” , Fox’s “The Mob Doctor” and CW’s “Gossip Girl.” But Univision has also had this success with major award/celebration coverage like the Latin Grammy’s and the “Sabado Gigante” premiere . The diversity of top rated shows legitimizes Univision’s major success with both drama, which can be watch later( Live plus 7 day) and award coverage (which has a much shorted shelf life for the audience). On October 27th the network a four hour televised celebration complete with “ international celebrities, music, games, prizes, and a fascinating walk down memory lane” for their 50th anniversary . In addition to dominating their market, the brand also used social media in the promotion of their “Sabado Gigante” through using a twitter handle, and a hashtag to create buzz with their tech savvy audience . The company’s continued and versatile use of social networking and digital participation mirror the company’s vision to remain relevant as their audience continues to embrace technology . Moreover, Unvision unveiled their new logo and tag line which is “ evocative of a human heart and three-dimensional in appearance and accompanied by a new positioning as “the Hispanic Heartbeat of America” represents the company’s enormous growth from a one station start up in Texas to a multiplatform innovative media giant . As Univision’s audience continues to expand, the company takes more strides to provide more innovative activities to satisfy their needs. Univision has aggressively taken steps to offer programing online and through mobile devices. The launch of UVideos is not new in the idea of providing online content, but it is unique and different in the idea that this site is rooted in technology . Offering in both a mobile app ,Xbox and partnering with Dish network on distribution of this service on the television and basing this program in social media sites like Facebook and twitter displays this company’s move towards innovation and trust in the future of social and mobile technology . Univision also used social media and second screen digital platforms in the promotion of their 50th Anniversary programing . As the Latino votes become more and more crucial,in American elections, Univision has provided major coverage of the election to their viewers. In addition to always having live translations of the Presidential debates, the station was deined the ability to join the major networks in participating directly in the Presidental Debates . instead the held their own “Meet the Candidates” conversations with Governor Rommeny16 and President Obama17 where immediate Spanish translation was available for the audience. Univision large audience for these events represent the importance of the growing presence of Latino presence in America and also Univision expanding power/control of an influence group of voters. With 239 million monthly listeners in the U.S., Clear Channel Media and Entertainment has the largest reach of any radio or television outlet in America. In the third quarter of 2012, Clear Channel Media and Entertainment (CCME) was up 1%, or $7 million, in revenues compared to the third quarter of 2011. This increase was primarily the result of a 3% increase in radio revenues, due to an increase in national advertising, digital radio services, and the iHeart Radio Music Festival in September. At the end of the third quarter, CCME had a revenue of $798.8 million, and Clear Channel Communications increased its overall revenue by 2% up to $1.59 billion. iHeartRadio is a company owned by Clear Channel consisting of a mobile application and an Internet radio website. Its website states that iHeartRadio is a “free, all-in-one digital radio service that lets you find more than 1,500 Live Stations or create commercial-free, all-music Custom Stations featuring songs from the artist you select and similar music” . The company has proved quite successful for Clear Channel and has helped keep radio in the 21st century. It allows users to stream from a wide variety of radio stations around the country. The company has evolved to become more versatile than just streaming radio stations over the Internet; it now has customizable stations similar to Pandora. In November, iHeartRadio announced that they had reached 20 million users and surpassed 135 million app downloads . September 27, 2012: Clear Channel made an agreement with Glassnote Entertainment Group, that will “align the companies’ business interests, accelerate growth and innovation in digital radio and enable Glassnote and its artists to share in all Clear Channel radio revenue streams.”  The agreement comes in hopes of accelerating the digital music industry. Glassnote, an independent record and publishing company, represents such artists as Mumford & Sons, Childish Gambino, Phoenix, and The Temper Trap. These artists and others represented by the music company will benefit from this deal with Clear Channel. With its values of Integrity, Excellence, Fairness, Sense of purpose and Inclusiveness, Belo Corp. is a multimedia company whose headquarters are located in Dallas, Texas. As one of the most respected and largest television groups in the nation, Belo’s television division owns 20 television stations that include but are not limited to affiliation with FOX, CBS, NBC, ABC and CW Network. Its main markets reach not only audiences from Dallas and Houston in Texas, but also the fast-growing Seattle market in the Northwest and Phoenix market in the Southwest. The Belo stations, which rank either first or second in practically all 15 markets where its business takes place, are capable of reaching more than 14 percent of U.S. television households in 15 highly-attractive markets. Under the leadership of President Dunia A. Shive and Peter L. Diaz, Vice President Carey P. Hendrickson and Guy H. Kerr, the 2,300 employees of the company achieved $650 millions in annual revenue in the year of 2011. Looking at the numbers of 2012, it is not hard to see a tendency for further growth. For more about Belo Corporation and its television division please click here . For more about Belo Corporation’s history please click here . Station programming, including the operation expense, decreased $1.3 million, which is two percent compared to the third quarter of 2011. This was mainly due to the reduced syndication programming costs. In the same quarter, Belo’s Station adjusted EBITDA grew almost 50 percent compared to the same time period of 2011 and still had a margin of 40 percent compared to the third quarter of 2011. In this quarter, Belo earned $17.7 million in political revenue and $13.4 million in Olympics revenue, both of which were significantly higher than the revenue recorded in the third quarter of 2008. Revenue from advertising, retransmission fees, barter, network compensation etc. increased nine percent in the third quarter of 2012 compared to the same time in 2011. This is mainly due to the double-digit increase in both Internet and retransmission revenue. In this quarter, the company generated the total revenue of $176 million, 16 percent higher than the third quarter of 2011. In the fourth quarter of 2012, the Board of Directors declared a particular cash dividend of $0.25 per share for each share of the Series A common stock and Series B common stock that would be paid on December 21, 2012, to the recorded share holders on November 20, 2012. Also, funded primarily by the company’s available cash, Belo announced that 6.75 percent of its Senior Notes, which the principal amount would be $175.9 million, would be redeemed on November 30 of this year, due May 2013. For more details about Belo’s cash dividend please click and listen to Belo at Deutsche Bank Leveraged Finance Conference  on October 10, 2012. For the fourth quarter, Belo expected the political revenue to finish in the margin of $29 million to $30 million, which would result in $58 million to $59 million of political revenue for all of 2012. For more about Belo Corporation financial report please click here . Primarily due to the increasing annual merit, the employee benefits, wages and station salaries of employees as well as the higher commissions of Belo Corp. raised as high as 4 percent, in other words $2.3 million during the third quarter of 2012 . Belo television station group includes affiliations with ABC, CBS, NBC, FOX, CW and MyNetwork TV, which reaches more than 14 percent of U.S. television households in 15 highly-attractive markets. For more about Belo’s Television Group please click here. Belo announced its election coverage plans, stating that the company’s news-producing stations would televise at least one hour of political coverage each week in the six weeks prior to the general election on November 6. The 2012 election coverage might include issue- and ad-watch programming, debates, and interviews with candidates from the local, state and federal level. A special spot named “It’s Your Time” which candidates can use to announce why they should be elected on Belo’s multicast channels was offered to them for free. 159 congressional and gubernatorial candidates participated in this program. To watch all It’s Your Time vedios online, please click here . KGW NewsChannel 8 was named Television Station of the Year by the Oregon Association of Broadcasters at its annual conference on September 7, 2012. For nine of the last ten years, the station had beaten its competitors and kept the title. KGW NewsChannel 8 also earned nine “Awards of Excellence”, and defeated all the other Portland television stations. Belo Corp. announced on the 18thof September, 2012 that Linda Danna had been named president and general manager of WHAS-TV, Belo’s ABC-affiliated station in Louisville, Kentucky. She would be in her new position on October 15, 2012. Danna recently served as vice president and general manager of KGPE-TV in Fresno, California. During her previous career, Danna had been an outstanding leader who was keenly aware of the media landscape and its emerging opportunities. One this day, Belo’s Dallas-Fort Worth television station broadcasted a debate featuring U.S. Senate candidates, in which Republican candidate, former Texas Solicitor General Ted Cruz, and Democrat and former State Representative Paul Sadler squared off in a live broadcast. WFAA, Belo’s ABC-affiliated station in Dallas, Taxes, would carry the debate live along with Belo Corp. Belo’s subsidiary station KENS in San Antonio would broadcast the debate on a delayed basis. The award was accepted by Eric Valadez, a WFAA producer, and Art MacLaren, WFAA’s chief director of the 6:00 p.m. and 10:00 p.m. newscasts . Belo Corp. Television Station WFAA-TV, the ABC-affiliated station in Dallas was honored with a National News & Documentary Emmy Award by the National Academy of Television Arts & Sciences on this day in New York. A Day of Weather, WFAA’s winning piece, continuously covered a heavy storm that inundated Dallas in September 2010 . On this day, Belo announced that Brad Ramsey had been named president and general manager of WVEC-TV, Belo’s ABC-affiliated station in Hampton/Norfolk, Virginia. He would start his new role beginning November 5, 2012. Since July 2008, Ramsey has served as vice president and General Manager of WCAV-TV (CBS), WAHU-TV (FOX), and WVAW-TV (ABC), all in Charlottesville, Virginia. His experience in the Virginia marketplace would be a significant asset to WVEC. On this day, Belo’s WFAA took home 21 awards of excellence presented by the Lone Star Chapter of the National Television Academy. This Belo’s Dallas-Fort Worth station was honored in various news categories including sports and weather, team coverage, breaking news, as well as in categories for technical achievement and local programming, topping all the other stations in the same market. The Nielsen survey result which took place from October 25 to November 21 proved that KGW NewsChannel 8’s leadership position in news continued. KGW NewsChannel 8 has the highest viewership of both local and national news programs by a wide range of audience in both rating and share averages in the entire 4 p.m. to 7:30 p.m. block as measured by Nielsen station estimates live and same day viewing . Looking to the fourth quarter, Dunia A. Shive, Belo’s President and Chief Executive Officer, indicated that the November 30 redemption of the 6.75 percent Senior Notes due May 2013 was expected to result in an after-tax charge of approximately $2.5 million in the fourth quarter of 2012. This would be an after-tax savings in interest expense of approximately $3.1 million in the first five months of 2013. On November 30, Belo’s Board of Directors declared a quarterly cash dividend for the first quarter of 2013 of $0.08 for each share of Series A common stock and Series B common stock to be paid on March 1, 2013, to shareholders of record on February 8, 2013. After its television division started out in 1948 with the establishment of WGN-TV in Chicago and WPIX-TV in New York, two stations that proved to be the heart of Tribune Television, Tribune Television continued to prosper and in 1981 the Tribune Broadcasting Company was born. Already having acquired a third television station, Denver’s KWGN-TV, Tribune Broadcasting went on to buy stations in Atlanta, New Orleans, Los Angeles, Philadelphia, and Boston in years to follow. 1958: KGWN-TV begins as Denver’s first television station. 1958: Los Angeles’ KTLA-TV is first television station to own a helicopter for news reporting. Tribune Broadcasting has bigger affiliations with major networks such as FOX and ABC. Tribune has seven FOX affiliated stations, all within Neilsen’s top 50 estimated markets for the 2012-2013 TV season – Seattle-Tacoma (#12), Sacramento-Stockton-Modesto (#20), Indianapolis (#26), San Diego (#28), Hartford & New Haven (#30), Grand Rapids-Kalamazoo-Battle Creek (#39), and Harrisburg-Lancaster-Lebanon-York (#43). Tribune’s one ABC affiliate in New Orleans ranks just outside the top fifty, coming in at #51. For the full rankings click here. Tribune Company’s Chapter 11 bankruptcy was signed off by Judge Kevin Carey, allowing the company to be owned by a number of hedge funds and banks. September 9, 2012: Viewers express unhappiness with Raycom’s coverage of Clemson University football games. Commercials for local business often interupted the video feed, and even some blank screens have appeared during the broadcast. Fans of ACC football worry that this quality professionalism from the network will lower the status and reputation of the league overall. October 26, 2012: Business Journalist, Erik Spanberg, in Charlotte, NC speculates that the new network Speed, a News Corp. owned property could grow in the Charlotte area to become an all-encompassing sports channel. This would mean new competition for Raycom Sports who is also based in Charlotte. Raycom Sports provides general sports news and specializes in ACC college athletics. With Speed moving into the area, Raycom Sports could lose viewers. November 20, 2012: Raycom Sports recieved six nominations for the 27th Annual Midsouth Regional Emmy Awards. The winners will be announced in January 2013. “Havoline Football Saturdays in the South,” “Kings of the Court,” and “ACC Road Trip” were nominated this year. October 3, 2012: Bounce TV announced it will be premiering its newest series, “Off the Chain”, hosted by Rodney Perry. November 7, 2012: Bounce TV announced that they will air their first boxing telecast and will continue airing matches throughout the season. September 4, 2012: The program expands into seven more markets in its second year in production. It will now be available in Detroit, Denver and San Diego which spreads its reach to about 30% of U.S. TV homes and 45 TV markets.